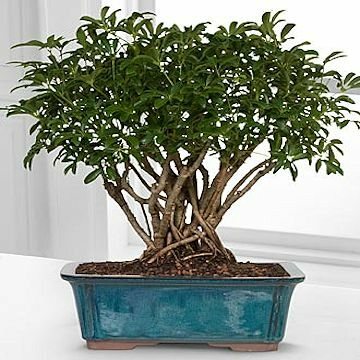 The Dwarf Hawaiian Umbrella Tree Bonsai makes an exceptional gift that your special recipient will love! The perfect bonsai for the beginner, this fuss-free tree is easy to maintain, doing extremely well in low light environments. Grown for approximately 8 years, this bonsai arrives standing 12 to 14 inches in height.